Everyone in the U.S. knows Amazon, but not everyone knows Alibaba or Flipkart. In the next five years, that’s going to change. 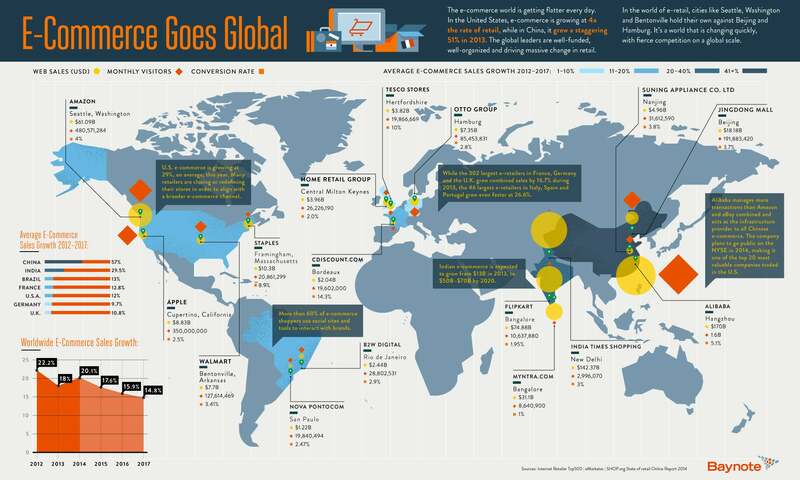 China and India are expected to see faster e-commerce sales growth over the next five years than any other country, according to this infographic compiled by Baynote, a firm that helps companies drive personalized shopping experiences across multiple e-commerce channels. That means bigger things for Alibaba -- the e-commerce behemoth of China that currently oversees more transactions than Amazon and eBay combined – and Flipkart, the e-commerce giant of India. Growth in e-commerce sales depends on a country’s prospering middle class, access to capital and the sophistication of the mobile to computer experience, Baynote's director of marketing Marti Tedesco said in a blog post. Take a look at the infographic, which was produced by Column Five Media, below to see where e-commerce is growing the fastest across the globe and which companies are leading the charge.